Opera is the ultimate musical experience, a combination of words, music, acting and staging, so why would you go to just hear an opera performed by an orchestra on stage with singers standing at the front? It is not just that tickets cost less because it is cheaper to put on, though that is of course true. The main reason is that for their Opera in Concert series Scottish Opera select operas not often performed because they lack the length and spectacle of the great opera repertoire. This means they are ideal for this form of presentation and with a great national opera company and orchestra and singers of international calibre, the absence of costumes, movement and scenery turns out to be less of a hindrance to enjoyment than you might think. Scottish Opera conductor Stuart Stratford’s admirably concise plot summaries, good programme notes and subtitles translating the Russian into English made the stories of Rachmaninov’s two short operas Aleko and Francesca Da Rimini completely accessible. Added to which, the scintillating vocal performances and empathetic presentation of the principal singers made the ‘action’ and their characters believable, despite the restricted acting space. Aleko was Rachmaninov’s Moscow Conservatoire Gold Medal winning graduation piece at the age of 19 in 1892. The story is not complicated: after an absence, Aleko returns to his band of gypsies, finds that his beloved Zemfira has betrayed him for a younger man, kills them both and then is exiled. An evocative orchestral prelude set the emotional scene and Rachmaninov’s writing for his principal singers gave each voice the dramatic impulse it needed to express the individual’s emotional journey. Evez Abdulla’s heroic baritone, all flashing eyes and expressive gestures, gave us an Aleko both passionate and tragic, while the glorious bass of Alexei Tanovitski brought a back-to-earth reality to the role of Zemfira’s father. Zemfira, sung with astonishing beauty and power by Ekatarina Goncharova, captured both her cruelty in betraying Aleko and her ultimate powerlessness. Stirring choruses (male chorus on one side of the circle, female on the other – as if in stereo) and fine playing of Rachmaninov’s melodious and captivating music by Scottish Opera’s Orchestra, gave Aleko a deservedly fine performance. In 1906 Rachmaninov himself conducted the first performance of his Francesca da Rimini at the Bolshoi theatre. In this concert performance the same singers took on new roles in a story based on an episode on Dante’s Inferno where, in the second circle of Hell, where the lustful are eternally punished, the poet meets lovers Paulo and Francesca and hears their story. The unsettling harmonies in the orchestral prelude to Francesca da Rimini, with the chorus weaving wordless lines around eerie string sounds, created a sense of restless unease from the outset. Without summarising the plot, the tragedy and core meaning of the story can be summed up in the line, repeated in the libretto: “There is no greater torment than to remember a time of joy in a time of grief.” Once again, the exceptional voices of the four principals brought urgency to dangerous passion, graceful lyricism to love and somber tones to sorrow. It took little imagination to visualise the scenes in which we heard Evez Abdulla as the wronged and murderous husband of Francesca, nor the seduction of Francesca by his brother Paulo sung by Ekaterina Goncharova and Oleg Dolgov respectively, who were both making their debut with Scottish Opera. The audience were enthralled by the quality of what they heard, and we were privileged to be present at the very first performance in Scotland of this important work from Rachmaninov’s oeuvre. This concert was the last in the current series, but the next series starting in October is already being advertised. It begins with two more Scottish premieres – of Puccini’s Edgar and of Silvano by Mascagni. With Benjamin Britten’s The Burning Fiery Furnace (at the Lammermuir Festival) to follow, I can think of few better musical ways to spend a Sunday afternoon. The story is simple, a 15 year-old Japanese child-bride is abandoned by her diplomatic American husband not long after the wedding; whose return three years later with an American wife kicks of the inevitably tragic & magically operatic conclusion. As usual, Kent packs her production with international soloists, a highly-praised chorus and a full tight orchestra, with star billing going to the uniquely entrancing vocal abilities of celebrated soprano Maria HeeJung Kim, from the Korean National Opera House of Seoul. Her voice is sweet & siren-like, but great tribute must be paid to Zara Vardanean, who plays Butterfly’s maid Suzuki – their duets are phenomenal, allowing HeeJung Kim’s vocals to flow like melting honey. The set is luscious, an authentic Japanese garden, whose ear-twinkling fountain-gush inspired one of my co-attendees to visit the toilet on more than one occasion. The First Act is a perfect paean to love, when the fabulously named Pinkerton (the surname is based on famous American detectives), bursts lungs with his Dovunque al mondo, in which he tells the American consul, Sharpless – played by the company’s best male singer, Chisnau-train’d Iurie Gisca – that the Yankee wanderer is not satisfied until he captures the flowers of every shore and the love of every beautiful woman. “I am marrying in the Japanese style: for 999 years, but with the right to cancel the marriage each month.’ A Spaniard (Giorgio Meladze) playing an American, singing Italian in Japan, via Edinburgh; one cannot get more Human than in these moments. First performed at La Scala in 1904, the Japan Puccini portrays is the one perched half-way between the opening up of the islands to the world in the 1860s, & the horrors of Hiroshima & Nagasaki. Indeed, Butterfly is set in the very latter city. The stage is set for tragedy, of course. Pinkerton admits as much in the first act when he sings of Butterfly being ‘small & delicate like a crystal,’ & an off-the-cuff mention of crushing, ‘her fragile wings.’ Meladze’s voice is clear, smooth & satisfying, like sitting in a bubble-bath drinking gin straight from the freezer – his stint singing with Jose Carreras at the Austrian Opera Festival in 2014 has clearly rubbed off. We know that tragedy is coming, & coming soon, but the sentiment of HeeJung Kim’s poignant ‘Un bel do vedremo’ was simmering still with the chirpy joys of the first act. Spurning the advances of local bigwig Yamadara, she stays stoically faithful to Pinkerton, becoming possessed with a faintness of mind & a total indifference to reality. Things then proceed rapidly dramatical, as one by one the audience’s hands became fixed over our gaping mouths, as our souls drained with the emotion of a superbly drawn out denoument. 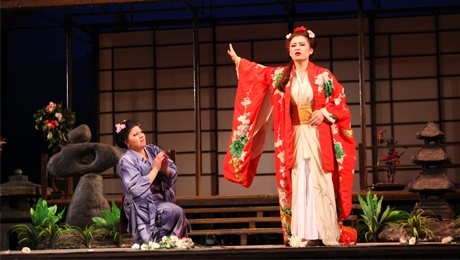 You can still catch her Madama Butterfly this Spring as one of the three operas that form part of Kent’s annual touring tryptych. This year she is offering up La Traviata & Rigoletto – both by Verdi – & of course Puccini’s oriental masterpiece. With Madama Butterfly, Puccini’s mercurial genius attains quintessential harmony, & watching this opera is rather akin to sitting on a marble seat admiring & studying a fine Gainsborough portrait to the sounds of summer birds. Kent has done brilliantly with her materielle, I especially like the entrance of Vadym Chernihovskyi’s Bonze to a cymbal smash, while her gaggle of geishas spinning paper parasols in authentic costume has seer’d a succulent indelible vision into my heart, as has the beautiful singing of HeeJung Kim. Where are you from and where are you living today? I was born in Sussex and lived there until aged 16, but our family was always travelling North to Northumberland for every holiday we could. I fell in love with Northumberland at an early age and, apart from a 10 year period in London in the 90s, I have lived and worked from there ever since. We now live in Harbottle in Northumberland at the edge of Northumberland National Park. Can you tell us about your theatrical training? I trained at London University and then at the School of the Science of Acting in London. This college, headed by Sam Kogan (I was taught by him), was a wonderful and opening place to train both in Acting and Directing. I trained while working as a full time music teacher and musician. Sam’s approach was a controversial but fitted exactly with my feelings about theatre; Stanislavskian at its heart but twinned with a radical new approach to the actor and directors craft. I have to say though, I have always trusted my natural instincts above anything. That is, a natural curiosity and feeling for theatrical space, musicality and physicality. When did you fall in love with opera? My first operatic experiences were watching my uncle, the great English Bass baritone Thomas Hemsley, perform in London and Edinburgh. I quickly became familiar with his work, including his longed period of working with Benjamin Britten on operas such as A Midsummer Night’s Dream and Death in Venice. I quickly found a love for early opera and majored in Early Music at degree level. From there, I performed as a singer in various operas. It seems an absolutely natural thing for me to combine both my musical and theatrical training in this art form. My particular passion is to work with young people in opera. It seems to me the perfect art form as it combines all the arts and creates a future generation of performers and audiences for this most immersive creative experience. What are your favorite operas to both watch & to direct? The operas of Benjamin Britten, Amadeus Mozart and Claudio Monteverdi. I love all of the operas of Monteverdi but my particular favourites are Orfeo and Poppea. I love Peter Grimes, Noye’s Fludde, The Little Sweep, The Turn of the Screw, A Midsummer Night’s Dream and Billy Budd. Le Nozze di Figaro is an absolutely favourite of mine too. Actually, I have directed Dido & Aeneas four times so that has to be up there too! What do you like to do when you’re not being musical? I am passionate about the natural environment, conservation and rewilding. When not in Northumberland, I like travelling to the Scottish islands and West coast. Also writing poetry in my spare time. You are quite the nomad when it comes to directing for the stage, where does the wanderlust come from? I will go anywhere where there is opera…! I love European and Russian theatre and am a passionate European. What is your role in Edinburgh Studio Opera? As a 50th anniversary special, ESO presenting a double bill production of Dido & Aeneas & Gianni Schicchi – why these two operas? There is a fantastic comedy-tragedy contrast between these two operas which the audience will be fully immersed in. I would love the audience to feel a cathartic sense of tragedy at the end of Dido & Aeneas and to be shocked and challenged through the new narrative of the piece, especially the relationship between Dido and Belinda but also the predatory nature of Aeneas. In Gianni Schicchi, which many will not have seen before, especially never in this traverse staging, I hope the audience feels completely taken into the middle of the fast, furious and hilarious narrative of this absurd comic masterpiece. What does the rest of 2018 hold in store for Robert Hersey? I am working to set up an opera company in the North East. We hope to stage two one-act operas in Autumn 2018. As stage director for the Brundibar Festival, I am working towards staging the opera ‘Brundibar’ with a large cast of young people in early 2019. After the huge success we had with our “La Boheme” and “Rigoletto” projects hCFlyde Opera are preparing their next production: Cosi fan tutte by W.A Mozart, in Italian (with English surtitles) and with double cast. This is a project to help young soloists to gain more stage experience and to learn a new role. Working with our amazing team and Orchestra of Clyde Opera Group will give singers the opportunity to improve their technique, work with the conductor in all rehearsals, then perform a full role in a well organised production, fully staged and with orchestra. This is the public’s opportunity to join us for 10 days and be part of a wonderful experience. CO’s previous performances of “La Boheme ” and “Rigoletto” were sold out- they are now convinced that the public will love this production too. Rehearsals and performances between the 19th-29th of July 2018 (GLASGOW, UK). Performances on the 28th and 29th of July 2018. Applicants who are accepted for an audition will receive notice of their acceptance by email or phone. Fees: All the participants accepted in this program will pay a participation fee. The fees are: Fiordiligi (soprano) £700, Dorabella (soprano) £700, Giglielmo (bass) £700, Ferrando (tenor) £700, Despina (soprano) £700, Don Alfonso (bass) £700. The fee includes the 11 days of the full program (masterclass, rehearsals with all our 3 pianists and orchestra, staging and singing lessons; also, lunch/every day is included + refreshments all day). If you would like to apply for 2 different roles please let us know in advance. The fee is paid in 3 instalments. If accepted into the program there is a deposit of £150 to be paid in maximum 30 days after acceptance (probably before the 25th of January 2018). The deposit is deducted from the fee. Accepted applicants will be responsible for their own flight and accommodation costs (accommodation could be provided if booked in advance for £475 -£550 / person) if you want to know more please get in touch. The organization could indicate available hotels and B & B options; information will be communicated to everyone interested by email.